Do you ever feel the tension of what you do as a youth worker? I feel tension when I consider the spiritual growth of my students. It’s the tension between the sense of urgency and the knowledge that discipleship is a long, slow, meandering process. I want them to know it ALL right. this. instant. But I know that’s not how faith works. We watch them take two steps forward, one step back and because we love our students we get frustrated. But I know better. I feel tension because while I want them to be living a deep faith now, I know that God is working in them daily, and that He won’t be done with them until they join Him in eternity. I feel tension when I realistically consider the impact I have on my students. I know the importance of meaningful, non-parent adults in the lives of teenagers. Studies show that these relationships anchor teenagers to their faith. I am that adult to a group of teenagers. So are you. But I also know that I don’t have near the influence that I want. I see them for an hour or so a week if I am lucky. (Text messages are great, but they only supplement the real relationship that happens when I’m hanging out with students.) I feel such tension here. I want to have a greater impact, but my impact is limited in a sense. I feel tension at times when I load up my family for the third or fourth time in a week to go to church. I love my church. I love our church family. I love the ministry my wife and I do with the teenagers and adults there. But I feel tension. There are some Sunday’s where I would love to not have the responsibilities that I have. Even though I know that what we are doing is what God has called us to do. There is tension. I feel tension when I lead students to know Christ more deeply through His word. I feel the tension of knowing that many of the things I teach I still struggle with myself. I feel the tension of wanting to make God known so clearly but knowing that I am so human and I that I mess it up as often as not. It is a beautiful, frustrating, wonderful, awful feeling. You know why? Because the tension we feel is brought about by actually giving ourselves to the mission of God. It’s the tension of people who aren’t on the sidelines. It’s the tension of people giving it their all, falling flat on their faces, and getting up to try it one more time. As much as it can be a struggle at times, I’ll take it. Where do you experience tension in your ministry life? A common scenario: A number of people are called to a function room for a meeting, since arrival no one’s made eye contact, there’s awkwardness and the silence is deafening. The meeting leader needs an effective way to get the disparate group to work comfortably and cohesively. Icebreaker questions are a great way to do this, they can be challenging, silly, memory based or related to the reason that the meeting is being held, but what they are designed to do above all is to relax the participants, remove pre-existing tensions and encourage them to interact and positively contribute to the meeting without inhibitions. If an attendee is terrified of looking inferior to the group then the best way for them to find calmness is to participate in a fun icebreaker in which everyone has to drop their guard, look less strained and serious and become familiar to their companions. Participants are forced to introduce themselves and interact whatever their inclination. The inspiring result is that they won’t feel the need to be the quiet nervous one in the corner any more so they’ll get more from the meeting and any activities. They’ll have had an early and quick getting-to-know-you conversation with everyone in the room. Icebreaker questions offer flexibility and are adaptable for use with children and adolescents, for personal gatherings and for professional based scenarios and if a meeting is a religious or social organization orientated one then this can also form the basis of the icebreaker questions. Which is your best feature? Which common saying or phrase describes you? Who was your role model when you were a child? What would be your perfect job? Have you ever won a trophy or medal? What is the longest word you know? Who is the most inspirational person to you? What is the best praise or advice you’ve received? Which would you prefer — three wishes over five years or one wish right now? If you could have one wish come true what would it be? Did you ever keep a New Year’s resolution? What was your favorite birthday or Christmas present? What was the worst present you’ve received? Which skill would you love to learn? If money was not a concern what would you do every day if you didn’t work? What was the most embarrassing moment in your life? Have you seen a ghost or an alien? Would you like to see into the future? Why? Would you like to be invisible for a day? Why? If you could rule the world for a day state something that you’d ban. If you had magical powers name something that you’d change. Would you rather be clever or beautiful? Would you rather be really hairy or bald? Would you like to be taller or thinner? What irritates you the most? Have you gone out with mismatched socks or shoes on? Where would you love to go on holiday? Why would you like to go to a tropical island or the Arctic more? Which planet in the solar system would you visit? Which animal would you choose to be? If you were a flower which one would you be? If you were a tree which one would you be? Have you baked a cake, who for and was it a success? What flavor ice cream would you be? Which chocolate bar is most like you? Would you rather be an apple or an orange? What fruit or vegetable would you be? Would you rather be a hot or a cold drink? Which task or chore is your favorite? Which task or chore is least favorite? Which office machine is your favorite? What type of car would you be? Did you ever lock your car keys in the car? Would you rather lock yourself out of your house or your car? Have you gone in to a room and forgotten why? If you could have true love or £1 million which would you choose? What is your favorite TV show and why? What is the best chat up line you’ve heard or had said to you? Who would you choose to be marooned on a desert island with? Which famous person would you like to meet? Which famous person would you never want to meet? If you could invite five famous or noted people (past or present) to dinner who would you choose? Which time period would you visit in history? Would you prefer to visit Earth in 2100 or travel back to 1900? Which person from history would you most like to meet? Memory games are hugely effective too, for example “I went on holiday and I took…” or “I went shopping and I bought…” Each person adds an item going around the room and the attendees try to remember everything which invariably causes laughter, improves concentration and initiates connections. Another format for icebreaking is to tell one fact and one lie about yourself and see if the others can guess which one is true. The icebreaking question possibilities are endless and very illuminating. Need more icebreaker ideas? We all believe in the camps and events that we are doing, and know there is no better environment for building community and bringing energy into our ministry year. With any luck, and a bit of strategic thinking and purposeful programming afterwards, we can ride the wave of momentum for some time. But only if people show up. I can’t tell you how many times I have envisioned and developed the most exciting and potentially world-changing event (at least that’s how I felt) just to be left in a panic about why no one was registering. I didn’t know if everyone was just waiting until the last minute to register or waiting until I decided to call everyone on my roster and remind them it’s time to sign up. Many times I would spend several hours on the phone convincing every last person that they needed to register before I lost my shirt for not hitting minimums. Not that the phone calls were a bad thing, in fact there was a ton of great ministry within those desperate hours of calls before our most important event. But I was always left frustrated, wondering why people weren’t signing up. After all, the same event last year was a huge success! Don’t they remember that? That’s when I decided to change my thinking, instead of hoping that everyone would show up to a camp that would be the springboard of momentum for months to come. I needed to build the momentum before the event even started. I began to realize that students don’t get excited about the doing the same thing. They won’t pull from the memory of last year’s experience because students live in the moment. They don’t always ask their friends if they are going before they sign up, and what if they do and their friend can’t go? Or what if a well-intending parent decides that everyone in their student’s circle needs to know that their kid isn’t going, so they don’t waste their one cabin request on a no-show (this has happened to me more than I’d like to admit). And lastly, students are skeptical (at least the ones at my church). Even if every event they have come to so far was off-the-chart fun, they always leave room for the thought that this one might be different. 1) It’s going to be a ton of fun! We know that students don’t care nearly as much as we do that their lives will be changed or that they will feel a deeper sense of belonging after camp. They show up for fun. They only tell their friends about it if it will be fun. And they only have a good time if it’s fun. 2) Everyone will be there! We know we can’t deliver completely on this promise (it’s mostly out of our hands) but we can be sure that we create the illusion that “everyone” will be there. So we speak in generalities, and talk about the total number of students we are expecting. And we never ask for students to raise their hand or cheer if they plan to go, which just gives the students in the room incomplete data to form a conclusion about who will be there. 3) There are a lot of new things this year! This is huge! The most important thing for momentum is new vision. Every year we try to bring in big change. We ask how we can get better, and what we are not doing yet? If we run out of ideas, we get really creative on this and try to find new twists on things that we’ve always done so that it feels new. Students like to know what to expect but they want it to be new, fresh, and exciting. We tell them everything; we don’t wait for a big reveal or keep some things secret. We want to build anticipation. Although the Rally is primarily for the students, it works to get leaders on board as well. But we think that there’s something more important to communicate to leaders. We usually do this over an email just before or after the rally, and then in a meeting or personal conversations later we revisit these points. The leaders need to know that God’s going to do something big and they can’t miss it. Every leader wants to know that their investment matters and, most of all, they want to be part of something bigger than themselves. As best we can, we communicate the anticipation that God is going to show up in a big way. I think God likes to deliver on this hope, and it keeps us on our toes and helps us give Him credit. And, every leader needs to know that this is the best investment of their time with students. We tell them stats, remember past wins, dream of potential moments, and give them vision of the near future when the event is over. Over these past few years-since we have been doing the Rallies-I have never needed to pick up the phone and beg people to show up. In fact our numbers continue to grow and our spots fill up sooner every year. And finally, the Rally helps us to have a developed plan well in advance rather than waiting until the last minute for everything. And it holds us accountable to follow through on everything we promised- that our next camp or event will be the best thing we have done yet. Kevin is the Middle School Pastor at Lakeside Church in Folsom, CA. He has two beautiful and spirited daughters and the most amazing wife, who has served alongside him in ministry for 13 years. Kevin has a passion for doing big, innovative, and creative things in ministry. He loves to invest in his team and partner with other pastors to see lives changed with the love of Christ. Kevin is a foodie and slightly obsessed with tea. He also loves to cook, date his wife, make his daughters feel like princesses, and take his motorcycle to the racetrack. Find out more about Kevin’s ministry by visiting MSMLakeside.com. Whether you’ve been in ministry two years or twenty years, we all have a tendency towards forgetfulness. It’s difficult to look back over last year or even the last month and point to specific stories of impact and transformation in the lives of our students. We know that the Lord is at work, but when ministry takes its toll, we regularly find ourselves on the verge of burnout. My student can’t possibly know the impact of her gift to me both in terms of encouragement and exhortation. Her note expressed her care for me, and her gift allowed me to enter into the discipline of remembrance. Taking up her challenge, I sat down every other weekend with my two jars, a pen, and a pile of notecards, and I began to write. At first, it was much easier to pen my frustrations; my mind was still racing through the weeks struggles and moments of conflict. To combat this bent towards the negative, I started writing three joy cards for every one frustration card, and once I got started, the moments of joy came more readily. I wrote down the moments where I saw students “get it” and the times when a student took a bold risk or made an important commitment or action step in their life moving forward. I even wrote down the little things that made me laugh or smile. Regardless of the kind of week I was having, these jars prompted me to seek the Lord and rejoice. It occurred to me that this could be a useful tool for youth workers and volunteers. The time commitment is minimal, and it yields meaningful stories, encouragement, and perspective. When my friends and family ask about my summer, I can quickly articulate a story from one of my joy cards. When I’m feeling upset over not seeing growth in my students, I can be encouraged in the ways that God has used me in the past. When I find myself dwelling on circumstances that are frustrating me, I’m reminded of how God hears my prayers and is still working all things for his good. I’d like to pass along my student’s challenge to you. Set aside a regular time in your schedule this year to record your joys and frustrations. Don’t be afraid to treat it as a discipline, and trust that the Lord will multiply your reasons for joy. You’ll find that counting joys is one of your best weapons in fighting burnout. My mother-in-law says often, “Opinions are like bellybuttons. Everyone has one.” We can say we are “neutral” on a topic, or we are just “reading God’s truth,” but we have to be very aware of the reality of our opinions. Many factors go into how we formulate opinions, and our students are in a vulnerable place where they are learning how to think critically. Often times they hear a news story or a parent’s opinion and are just repeating what they hear. If they hear us and we are not careful, they might go home and present our ideas as truth. We have to be very careful to present only facts as facts. Everything else we must preface with a statement like, “This is my thought on this, or the way I look at this situation is this.” When students ask, we have to think before we speak. We like to say we can insert ourselves in someone else’s shoes. However, we can’t ever truly put them on and walk around in them. We can never fully know what someone is thinking or feeling, unless we are them. Our students might formulate opinions not merely based on what they hear, but on their own experiences and pains. I can empathize but I can not sympathize sometimes. Before we start sharing our thoughts on a topic, we must take into account there may be reasons hiding in our hearts and the hearts of others why we each hold the perspective we do. In a social media driven world, we like to process private thoughts publicly. We have gotten used to sharing and venting without thinking about the repercussions, not merely online or in text but in person as well. This can make us accusatory, telling others how they should think or feel, or presenting an opinion incorrectly as truth. For example, my daughter had a friend whose small group leader told her that predestination is a fact. He did not present it as an interpretation of Scripture but as the way God wants it. This same friend struggled with some deep hidden shame. She admitted to my daughter she felt like the Lord could not have chosen her because she was simply too broken. There was no way a loving Savior would pick a wretch that was “that bad.” It has taken a MIGHTY work of the Holy Spirit to undo this lie, backed with a lot of grace and Scripture. While the young woman does believe now that Jesus would want her, she still grapples to believe that she doesn’t have to prove to him why he could. Be aware, be careful. Always lean more on the side of compassion and love. Finally, never be afraid to say, “I can’t wrap my mind around this, let’s pray.” We can say things like, “Injustice should hurt. Let’s pray.” Maybe it’s as simple as, “Let’s pray.” The circumstances might not change in a dying world, but we are reminded of who is the only one who can fix this. Compassion and love should always win before we point fingers in judgement. Everyone holds an opinion on nearly everything. It is not always an issue of right or wrong, but genuinely just difference in point of view. If God wants us or our students to change our mind, don’t worry he is big enough to make that happen. …or more specifically, their total lack of Bible-reading habits. We’ve talked and encouraged and bribed and purchased devotionals, but it seemed like no matter what we tried, we couldn’t make anything stick. Until we finally did something that actually worked, and it happened on accident. Now, I don’t really believe in accidents as much as I believe that sometimes God moves in ways that we never imagined or intended. It was Saturday night when I finally realized that I had somehow double-booked myself on Sunday morning. Somehow, I had scheduled myself to teach in two places at once. But instead of rounding someone up at the last minute or loading up some sort of video, we quickly devised a different plan. We took the Scripture passages I was going to teach on, and instead of having time set aside for teaching, our students would read the verses to themselves and formulate their own questions to lead their own small groups. I thought it was a brilliant scramble maneuver. It turned out to be so much more, because what happened after that was that more of our students reported becoming Bible-readers during the week than anything we’d ever tried before. Think about the Bible from the perspective of an overwhelmed pew-sitter. We come to church and a person who probably has an advanced degree is explaining the Bible to us. I’ve listened to sermons that lasted 30-40 minutes so that a person could unpack just one verse. This kind of teaching is good and sound, but it also has the unintended effect of making the Bible a little intimidating. After all, if it takes seven years of schooling and thirty minutes of lecture to explain the eighteen words in John 3:16, then what hope do I have to read through an entire chapter and have it make any sense? That’s how our students viewed the Bible: as a clunk, difficult thing that they were not intelligent enough to comprehend. But when we cut the teaching time to provide them reading time, light bulbs went off. They could read one of Jesus’ parables in two or three minutes and it actually made sense to them! They realized that they didn’t need a Master’s Degree to take something from Scripture; often they needed just a few minutes. This was a big deal and once they found that at least parts of the Bible were intellectually accessible to them, they were hooked. Now, we repeat that happy little “accident” every single year. Here’s how we do it. We create a three-week series where there’s no teaching time, only “reading time”. Students spread out throughout our worship space and read on their own. We usually choose the passage. Students use that time to read Scripture and formulate questions. They generate their own questions, and then ask those questions of their peers in small groups. Adult small group leaders are instructed not to answer questions. The idea here is that we don’t want students conditioned that they need a “qualified” adult around in order to understand Scripture. We want them to have the experience of reading Scripture on their own and talking with friends about it and gaining something from it. Small groups are a blast at these sessions, and more importantly, they leave encouraged and excited to open up their Bibles again when they get home. Beyond doing this once a year, you can incorporate this technique other times throughout the year as well. We have a mix of churched and non-churched, as well as middle and high school aged. So we split up our small groups by middle or high. That seemed like a smart idea for us. Thanks for thinking of this. We called the night DIY night and had DIY activities like a paper airplane competition, marshmallow & Spaghetti tower building and tinfoil boat building. Also considered doing duct tape wallets or any duct tape craft. Take a few minutes to figure out how you can do this in your youth group. 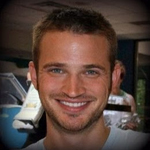 Aaron has been in youth ministry for over 15 years. He is currently a youth pastor in South Bend, Indiana. No youth ministry has ever had too many volunteers. When you’re dealing with caffeinated teenagers, you need all the help you can get, and so you’re always on the lookout for your next great volunteer. It’s just that sometimes they’re really, really hard to find. You put out a callout email to all of your parents. No one responds. You make an announcement from the pulpit. Nothing. You get a blurb, front and center in the church bulletin. Crickets. MOST PEOPLE WON’T READ IT. I know, someone at your church (maybe you!) worked really hard to collect, organize, and publicize all of this information. The sad truth is that almost no one will read the whole thing. Most people will peruse the document, looking for things that pertain to them and tactically filtering the rest. If your plea for volunteers is in the Youth Ministry section of the bulletin, you shouldn’t expect it to be seen by people who aren’t already somehow invested in your youth ministry. If you’re looking for a few high-energy twenty-something adults to help with your Junior High Retreat, you won’t find them in the Youth Ministry section of your bulletin, because they don’t read that section, because they don’t expect that there’s anything for them there. THEY’LL ASSUME IT APPLIES TO SOMEONE ELSE. The vast majority of people do not believe themselves to be qualified to help in youth ministry. Either they’re too old or they don’t know enough about the Bible or they’re not cool enough or they feel like just don’t get teenagers. You know that those things aren’t disqualifiers for youth ministry. Shoot, I’m too old and not cool enough and I definitely don’t get teenagers a lot of days. People have an idea in their head of what a great youth ministry volunteer looks like and it’s usually not them. Even when (and if) a potentially great volunteer reads your blurb, she’ll usually tend to believe that it was written with someone else in mind, and she won’t give it a second thought. I assumed you were looking for college students. I don’t think the kids would be excited about hanging out with dads all weekend. I thought the word chaperone meant parents. It’s kind of ridiculous, I know. But when a church bulletin goes to everyone in the congregation, every person in the congregation tends to assume that they’re not as qualified as someone else. And when you assume that someone else would be a better fit for a role than you are, you tend not to follow up. THEY MIGHT JUST FORGET THEY READ IT. Most of our blurbs end the same way, by imploring people to email the youth minister if they’re interested. Given that most church bulletins are read in church pews, while people are far from their computers and where smartphone use is frowned upon, there’s a bit of a leap here. The church bulletin helps you recruit a volunteer if they read it, if they believe that they’re qualified, and nowif they remember to send you an email when they get home. That’s a lot of ifs in one sentence. When you receive nothing in response to a printed plea for volunteers, it’s easy to get jaded and wonder why there aren’t any good people who are willing to help with what is an eternally important ministry. Most of the time, that’s not it at all. It’s been my experience that most people will be glad to help if they know they’re wanted. Your ministry could use a few more volunteers, so let’s go about looking for them in a way that actually works. We’ll start by eliminating all of those ifs and we’re going to do that by recruiting volunteers one at a time. Attend church functions where large amounts of potential volunteers will be gathered. Don’t sit by yourself at potlucks. Talk to a lot of people. And when you talk to them, talk to them about youth ministry and talk to them about how they might fit into youth ministry. When you put something in the bulletin, they might see it. When you talk to them directly, you can be certain your message was received. When you talk to people, qualify them immediately. If you can’t yet fill in that blank, then you’re not yet ready to make the ask. But when you can fill in that blank, you’ve eliminated the second if. You’ve guaranteed that they’ve received your message and you’ve given them assurance that they’re the right person for the job. Even better, you’ve eliminated the last if altogether. They can answer you on the spot and if they need time to think and pray about it, you can be responsible for following up with them. You’re no longer dependent on whether or not they remember to pursue it because now you can pursue them. It would be great if you could dash off a paragraph outlining your need for volunteers, send it to the church secretary, wait for the bulletin to go to print, and then check your email on Sunday afternoon to find fifteen new youth ministry volunteers lined up and ready to go. Problem is, that’s not how it works. In my twelve-year youth ministry career, I have never successfully recruited a single youth ministry volunteer from the church bulletin. As in zero. None. Nada. Not happening. But when I talk to people, when I listen to them, when I qualify them, and when I ask directly, I receive a YES in return well more than half the time. You can too, if you take the time to talk to people, know them, and go after them individually. Good luck finding your next great volunteer. The other day my team and I went out to lunch and began to chat about what we need to do to go to the next level. Before we can do that, we wanted to chat about how far we have come this year. Things have changed a lot. Our culture is way different. Our worship pastor said, “It’s like we have a whole new group of people and values.” It’s true. The atmosphere is way different now, intentionally so, and it’s been something we have ben working towards all year long. All year long we have been striving to change the culture of our Wednesday nights to one of actively seeking Jesus, leaders who are bought in, and one of fun, and all of the things we have done are starting to pay off. Pray – Our team spent time in prayer together. We got together and dreamt and wrote down our values what what we wanted to see in our ministries and we began by giving it up to God. Yes, people can change the culture to a point, but the type of change that we feel called to introduce to our students can’t come from us, we don’t have that power. Only Jesus does. Give it up to him. Observe – Before changing anything, spend some time trying to figure out the “whys”. I took crazy detailed notes. I looked like a creeper in the back as I took notes and began to write down things that could/needed to be changed. From the tech, to stage and program, to volunteers, job descriptions etc. Everything was under the microscope. After months of seeing how our systems were set up and looking at what they were producing, we began to address them one by one. Apply slowly – At first there was just cosmetic stuff to make services flow better or look better. Everything we changed first were things we had the power to easily change. Graphics, social media, sermon illustrations, song choice, band and games we played. Changing the culture is not a “band-aide” mentality, you can’t just rip it off. People are biologically ingrained to resist change… so do it gracefully. After the services were were we wanted and we found a good balance, then we moved to people. Volunteers – People are different than programs, we all know that. From the very beginning of me starting my position, I casted vision of where we want to be. Along the way, some people realized they were not on board, so they decided to get off. Others, not so easy and hard conversations followed. You can never repeat your vision enough. By the time you are tired of hearing your vision, your volunteers are just beginning to get it. Adjusting the vision of current volunteers can happen and when they get it, they go after it. Once we established who is in or not, we began seeking after new leaders with this new vision who all they know is the new ways and when they get it… they are bought in. Culture begins to leak from them to your students. Relationships – Now that we have these leaders with this vision of where we are going and they know what success looks like, we release them out on students. Volunteers who understand the vision of your ministry and know what success looks like are unstoppable forces in the name of Jesus. This summer, all events we had were purposefully relational. Park days, beach days, summer camps with the leaders who get our vision has been one of the coolest things. This has established our core group of students and now we get to build with an incredible foundation moving forward. I know there is a ton more we can all say when it comes to the culture of your group and I know the culture is different in every group. I do know, and have experienced, that if you don’t like the culture you can begin to prayerfully, slowly and change the culture you desire for your leaders and students to come to know Jesus in a way they have not been able to with the current culture that is in place. As a girl grows up, men will come in and out of her life, but the one man who will always be there is her father. 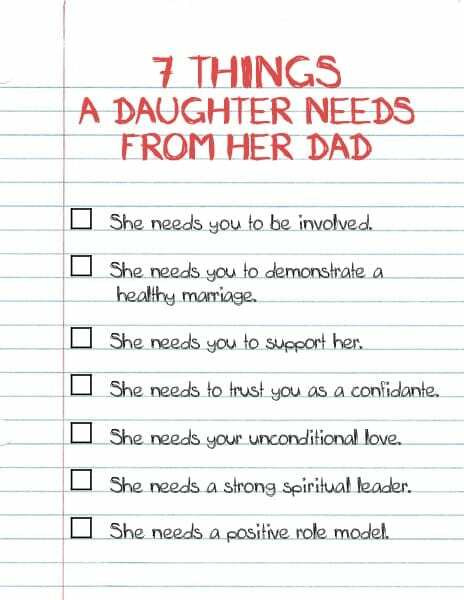 A father plays a vital role in his daughter’s journey to adulthood, and below are seven things what a daughter needs from her dad. Our printable version is below. 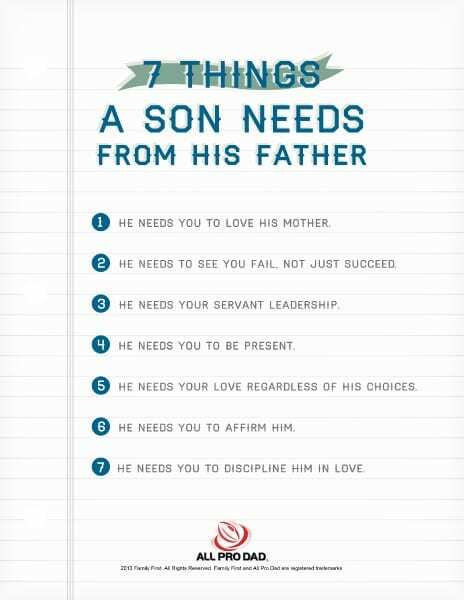 Also, be sure to check out the 7 Things a Son Needs from His Dad. 1. She needs you to be involved. A daughter needs her father to be actively interested in her life. “Actively interested” does not refer to the second-long conversation that sometimes happens between a father and daughter when he asks how her day went and she replies with one word. A father should participate in his daughter’s hobbies and activities by displaying interest. For example, if she is interested in collecting coins, take her to coin shows. Use the Internet to learn about rare coins and talk about them. Is your daughter talented in the any sports, such as volleyball? Whether she wants to play or just enjoys watching the games, become an enthusiastic fan and supporter! Show your daughter that you are interested in her life by learning more about it and trying to become a part of it. 2. She needs you to demonstrate a healthy marriage. The first relationship a daughter experiences is the one between her mother and father. If her father disrespects his wife with physical or emotional abuse, a daughter might come to believe that is the expected relationship with a husband. However, a father that displays physical affection, respect, and a true partnership with his wife provides an incredible example that his daughter will want to mirror in her own life. 3. She needs you to support her. Even though a father may not always agree with his daughter, she needs to know you will support her. When a father fully and wholeheartedly supports his daughter, she will develop strong self-esteem and a positive self-image. This doesn’t mean that you always have to agree with her, but show her that while you might not agree with a choice she is making, you will always believe in her as a person and have confidence in her abilities. 4. She needs to trust you as a confidante. When your daughter does come to you and discusses personal issues and problems, she needs to know that you will treat them with respect and confidence. They shouldn’t become dinner-table conversation with the rest of the family. 5. She needs your unconditional love. Just as our Father in Heaven demonstrates unconditional love, fathers on earth need to display this as well. Unconditional love requires that a daughter knows no matter how badly she messes up, her father will be there, not to ridicule and demean but to forgive. 6. She needs a strong spiritual leader. A father should be the spiritual head of a household and should take charge of his children’s religious education. Pray with your daughter! Don’t be shy about bringing the Lord into your conversations with her. 7. She needs a positive role model. Many daughters today lack a positive male role model in their life. A father is the first man in a girl’s life that she will intimately know. Her father sets the standard for all other men in her life, and a positive role model will help her choose a good husband in the future. Take a moment for some self-reflection. Are there any habits you need to break? Are there some areas of your own life that could use a “spiritual overhaul” and prayer? When your daughter sees that you are willing to examine your own life and make changes when necessary, you provide the best example she could ever have of accepting responsibility for her actions. As a boy grows up, there will be many people who influence him and his development into adulthood. As a father, you want to be the main influence in this area. You are, and should be, his most important role model. Below are 7 things to help you be the best role model you can be in your son’s life. Here is a printable version for you as well. Don’t forget to check out the 7 Things a Daughter Needs from Her Dad too! 1. He needs you to love his mother. When you love your wife, or the mother of your son, you are showing him how to treat his mother, his sisters, and all the women he’ll meet in his life. This will set the foundation for the relationships he will have later in his life. 2. He needs to see you fail, not just succeed. The best teacher is failure. The best type of failure to learn from is someone else’s. When your son sees you fail, and handle the failure well, he sees that it is okay to make mistakes and that mistakes can be great teachers. A boy who is not afraid of making mistakes will grow into a man positioned to accept and conquer great challenges. 3. He needs your servant leadership. You may or may not be the boss at work. You may or may not be the pastor or minister at church. You may or not be a leader in your community. But you are the leader of your family. Your son needs to see true leadership in your home. He needs to see you leading by serving. When he sees you leading by serving, he will better understand leadership and be able to more effectively lead versus follow his peers. As he grows, he will better lead his family, lead at work, lead at church, and lead in his community. 4. He needs you to be present. As you fulfill all the different roles you have, you may be pulled in multiple directions. He needs you to be present in his education, in his social life, in all areas of his life. Some areas are not intended for mom only, or for his friends only. Your presence in all areas will give him the support he needs. 5. He needs your love regardless of his choices. You may be the biggest sports junkie not living in Bristol, CT (where ESPN headquarters are located). And your son may not be able to kick a ball if you placed it on his toe, nor care that he can’t. No matter what choices your son makes, he needs you to love him even if they are different than yours. Even when they are wrong choices. Your love and guidance will open the door to trust and acceptance that build your relationship. And it will build his self-esteem. 6. He needs you to affirm him. “I love you, son.” “I’m proud of you, son.” “You are amazing, son.” “I know you can do it, son.” “That was an amazing play you made!” “You are a hard worker.” “You messed up, but I know you’ll bounce back.” Your son needs your encouragement. He needs to hear the words that let him know you love having him as a son. 7. He needs you to discipline him in love. When you discipline your son, you set boundaries and expectations. He is going to make mistakes just like you did as a kid and just like you do now. But he also needs to know that his actions have consequences. Disciplining him in love will teach him to consider the consequences his actions will have. This will prepare him to think and evaluate the choices he makes both now and in the future.